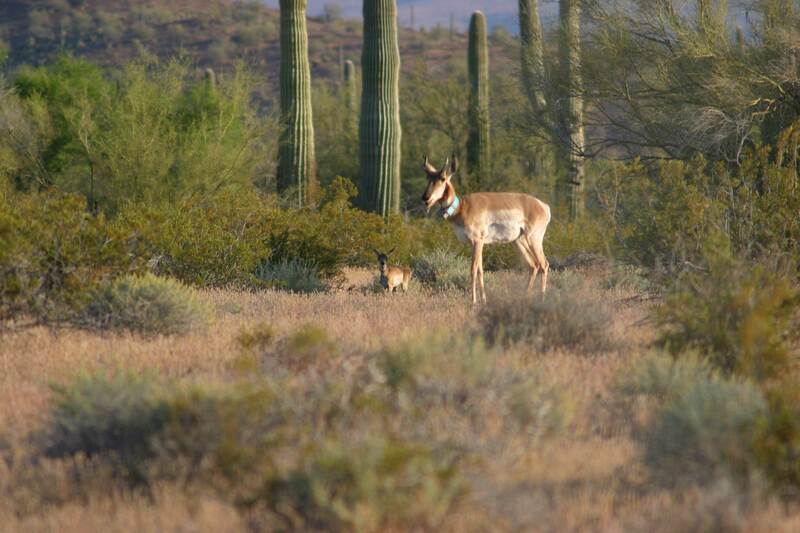 Project Summary: A cooperative captive breeding program was established in Arizona to halt the decline of the endangered Sonoran Pronghorn and to seed new populations of the species in the state. The Sonoran pronghorn once roamed vast areas of the Sonoran Desert, but is now limited to three small populations: two in Mexico and one in southwestern Arizona. In 1991, Arizona’s population dropped to just 250 animals. In the 1990s a severe drought set off an even more precipitous decline; by 2003, only 21 animals remained. Federal land managers and the Arizona Game and Fish Department (AGFD) resolved to save the U.S. species by establishing a captive breeding program. The Department of Defense (DOD) provided funds and program planning, the AGFD managed day-to-day operations, and the USDI Fish and Wildlife Service furnished the breeding location. The Sonoran pronghorn is shy; land managers worried that the animals might die from stress during capture, transportation, and con. nement. Also, they were not sure if the enclosure would ward off predators. If they failed, it could lead to extirpation of the species. AGFD, Marine Corps Base Yuma, Luke Air Force Base, Cabeza Prieta National Wildlife Refuge, Organ Pipe Cactus National Monument, USDI Bureau of Land Management (BLM), USDI Fish and Wildlife Service (FWS), Phoenix Zoological Park, and the San Diego Zoological Park. In 2003, a captive breeding facility was established on the Cabeza Prieta National Wildlife Refuge, populated with pronghorn from both Mexico and Arizona. Biologists enclosed 640 acres with a double fence, the outer portion electrified. Food plots were established and irrigated. Despite careful handling, the first animals moved to the breeding facility died from stress. Eventually, two females from Mexico were captured and successfully relocated to the enclosure. Later, several more animals from the Barry M. Goldwater Range were successfully captured and relocated. Ten fawns were born in early 2005; all are likely to survive because of the abundant food supply and protection from predators. Fewer than 50% generally survive in the wild. To maintain genetic diversity, male fawns will probably be released this winter. The females, plus as many as 15 more Mexican animals, will be bred until the population reaches at least 300 animals. Though the species is not entirely out of danger, the recovery team is beginning to think about how best to release the pronghorns from the enclosure. They also are studying locations where a second population could be established, including two adjoining areas: the Kofa National Wildlife Refuge and the U.S. Army’s Yuma Proving Ground. Program partners developed a double fence, electriﬁ ed on the outside perimeter, to protect the pronghorn. Advanced handling techniques avoided stress-related deaths.